At least once a day - and most days, twice - I drive my eldest daughter eight miles to the skating rink. The road we drive is Interstate 83, and the entirety of the drive is through the Harrisburg metropolitan area. Some days, the drive can take twenty minutes or less. Usually there is some snarl of traffic here, another jam there as the highway bottlenecks to two lanes and then one lane. The rush hour starts at 7:00 AM and pretty much lasts the entire day until 7:00 PM. Fridays it's worse. Rain days are worse still. And even though the road crosses the mile-wide Susquehanna River with a view of the city skyline and mountain vista to the north, and the specter of Three Mile Island to the south...well...after five hundred or so crossings the drive begins to lose any scrap of novelty or hint of excitement. Even ten-car pileups with smoke and sirens become - unfortunately - workaday. So a few days ago, trapped in another endless slowdown of traffic on a part of the highway not quite in the city, not quite in the suburbs, I tried a little mind game to pass the time. Instead of being stuck in the gray, drear location of a not-quite-anywhere overpass near Harrisburg, I suggested to my daughter that maybe we were actually somewhere else. I suggested that the nondescript sameness of the site opened a sort of time-space portal that could alter our awareness of where we were. That the gray, blending edges of the scenery would allow us to sort of slip through this place, shift ever so slightly and end up, really, in any twin location that exists just on the outskirts of almost every major city. There are elevated highways leaving every city - not through the showcase window that offers the best prospect of the art and industry of a place, but through the back alley where deliveries are made. The few brick warehouses with fenced in parking lots and garage doors covered in graffiti tags. Three our four scraggly trees growing at odd angles from sad, small patches of dirt. A railroad track. Of course, a railroad track. "Just think! Right now this same scene is playing out in a lot of cities all around the world. We could be anywhere! There is a section of road just like this in Chicago, in New York City...in London or even Rome. Right now, there are people stuck in traffic on overpasses just like this in Denver or Sao Paolo. Johannesburg and Tokyo. Looking at views of warehouses and scraggly trees and bits of railroad yards. We don't have to be here in Harrisburg. We could be far away from home right now. 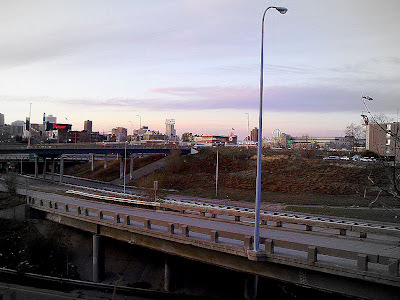 This overpass can teleport us to any of thousands of similar overpasses anywhere on the planet! Makes the sitting around feel more exotic and cosmopolitan, yeah? More like an adventure!" this instant excursion to far away lands that look, after all, very much like this gray and worn part of Harrisburg that's only meant for passing through, mostly, unless you happen to be a scraggly tree or making a delivery to a warehouse. And then without saying anything, we both decided that this was the most depressing and stupid time-space travel machine in the history of the world ever. And we were mildly glad to be home. Incidentally, my word verification today is "waxinglo" which I'm pretty sure is a dessert topping - no a floor wax! @Venus - yah. I've tried that trick as well. Usually, I just have an anxiety attack since I'm able to trick myself so well, that I can't remember why I wanted to be here in the first place. Waxinglo! It's a dessert topping! It's a depilatory for legs! Sorry, not in Vegas. We don't have elevated roads and there are no trees in the back areas. We do have a railroad track though. And the sun would be shining, because it always is.